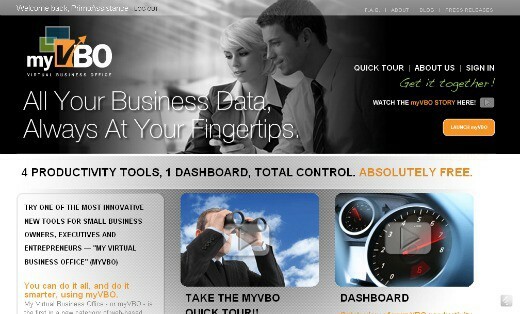 To review MyVBO as just a Twitter program would not be doing it justice, as it is so much more. MyVBO is just as the name implies, it is My Virtual Business Office and, as a Virtual Assistant, it has become the one tool I turn to for increasing the productivity of my business. However, since Michelle asked for a “Twitter program” review, I will focus my review on MyVBO’s Twitter application while just touching on its other very useful features. 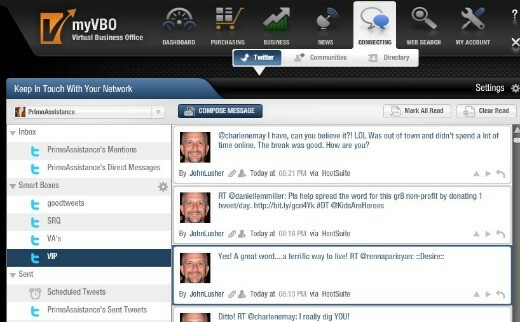 The first feature of MyVBO that makes it my top choice for Twitter is that it is a web-based program. As a former Tweetdeck user, I like the fact that I can access MyVBO from any computer without having to download an application to each one. Signing up is easy, just click on the “Sign Up” button, create a unique username and password, and fill out a few lines of information. You will receive a confirmation email to activate your account and then directed to log in. Once logged-in you are taken directly to your sleek customizable dashboard. I love how I can customize my dashboard with any of the available modules including my latest Twitter feeds, top stories from my news feeds, stock ticker, weather from various cities of my choosing, product price searches and so much more. Connecting your Twitter account to MyVBO is easy. Simply go the Social Networking area of the Account Module and follow the instructions. You can then add and manage multiple accounts directly from the Connecting module. This feature is a must for me and makes the managing of my clients’ Twitter accounts much more productive than switching back and forth from various Twitter products. You can organize your followers into different groups by setting up “Smart Boxes”. Notice how @JohnLusher is hogging my VIP Stream…gotta love John! Reply, ReTweet, or Direct Messages by clicking on the appropriate icon in the follower’s message. Send a Tweet by selecting Compose Message. A separate window pops up for you to add your tweet. If your message runs longer than 140 characters you can shorten it by selecting the facing arrows below the message window or shorten a url by selecting the URL shortener just next to it. Set up and link your Ping.fm account to have your tweets sent to multiple platforms including Facebook, LinkedIn, etc. Tweets can be scheduled by clicking on the Schedule link. 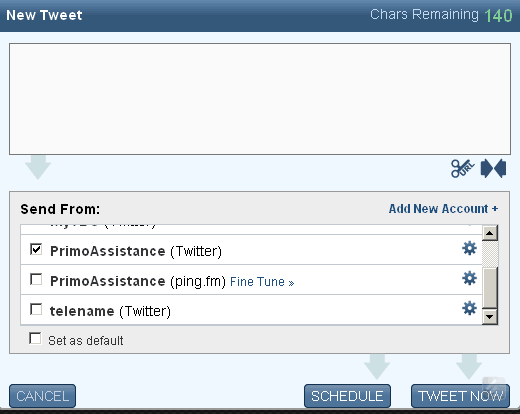 You can add a tweet to a rolling schedule or set it up to be posted at a specific time and date. MyVBO is already linked to a number of news feeds under their News Module, but adding more is quick and easy. You can add your favorite news sources and blogs – just directly enter an RSS link address by following the instructions. Once your feeds are added you can organize them however you prefer. The feature I love best here, is being able to directly tweet a news article or blog post from the News Module (and urls are automatically shortened). As I stated earlier, MyVBO is so much more than just a Twitter application, and, while its Twitter features are more than enough reason to use the program, the other applications it offers (product pricing & purchasing, Quickbooks integration, web stats, web search, etc) make it the one business tool that any small business should be using! Diane Cominotti (@PrimoAssistance) is a Virtual Assistant, and, as the owner of Primo Assistance she helps small businesses and entrepreneurs tackle the overwhelming responsibilities of running a successful business. Diane holds a degree in Environmental Science and worked for over fifteen years in scientific fields such as bioremediation and aquatic toxicity. As a Laboratory Project Coordinator, she acted as an advocate and liaison for clients, enhancing her natural abilities in customer service and client relations. She focuses her strengths as a Virtual Assistant on Social Media management, web research, document writing, editing, and proofreading. Connect with Diane on Twitter, Facebook, LinkedIn or visit her website.